This is just embarrassing. Wish You Well was the winning title for Tell Me What to Read back in MARCH. Yes, March. More than six months ago. But I have persevered. And now, many moons after finishing the book, I’m finally writing something about it (you may wonder if, after all this time, I can even remember what the book is about. I am wondering the same thing). The story begins with a car accident. Lou and Oz (a young brother and sister) lose their father and their mother goes into a coma that shows no signs of losing its hold any time soon. They are shipped off to live with their great-grandmother, Louisa, in the mountains of West Virginia. Louisa raised the childrens’ father too, and he always spoke lovingly about her, but when he left West Virginia in his early adulthood to become a (quite successful) writer, he never once returned, despite the fact that his books almost always revolved around West Virginia. Of course, being big city children, the new life on a rural farm comes as quite a shock to Lou and Oz. But, eventually, they begin to make friends and enjoy their new lives, although their mother’s failure to come out of her comatose state wears on them both. And then, it looks as if Louisa might lose the land (which is really the ONLY thing she has left – they are dirt poor up there) and a legal battle commences. The courtroom scenes were my favorite in the book and the only time where I felt really gripped by the story, but the resolution of the legal battle? Very contrived. Bah. I still liked it, though. The characters are so nice, I couldn’t even help myself. It very much has an old fashioned feeling to it, and that charmed me so much I could forgive the ending. I’ve heard this is very little like Baldacci’s other books, which makes me want to read some of his other things to compare. Any recommendations? Copy checked out from my local library. About five times. 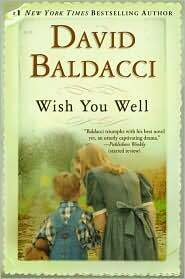 Baldacci normally does crime type novels, I think, but he did one called Christmas Train that is one of my mom's absolutel most favorite books in the world. It's the one she brought to DC for him to sign when we went and he was pleased as punch that someone showed up with that one instead of his more popular crime ones. I do not believe this. Not at all. This author sounded familiar, so I went to the bookshelf. This book was right there. The other book is The Simple Truth. It seems to be a murder mystery/thriller set behind-the-scenes of the Supreme Court. Will have to read both. Thanks!